At the start of each topic in the textbook I always have the students write the new vocabulary in their English notebooks. 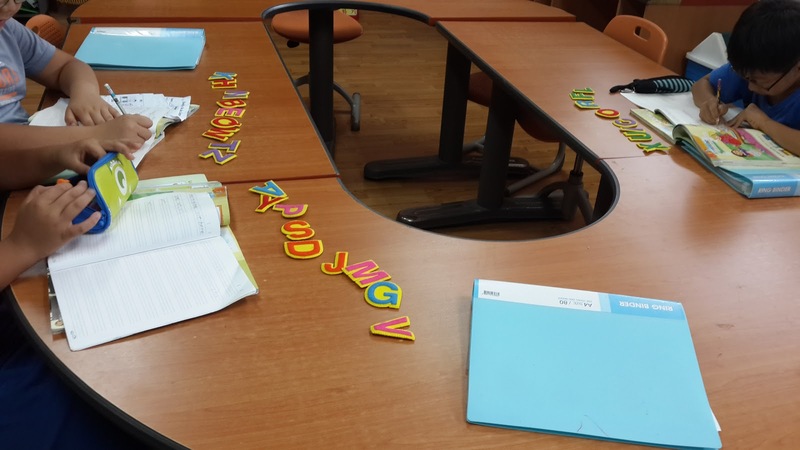 They write both the English word and word in Korean so that they have a little English to Korean dictionary with them in every class. Sometimes I will play games or have mini quizzes where I tell them to refer to their notebooks as well - I think this routine is very important. Alphabet letters on cards or foam letters, etc. You could print these out also. Next, I have small classes - for my grade 3 class of 9 I gave them more than one letter each. If you have a larger class I suggest giving about 3-4 letters but to multiple students. 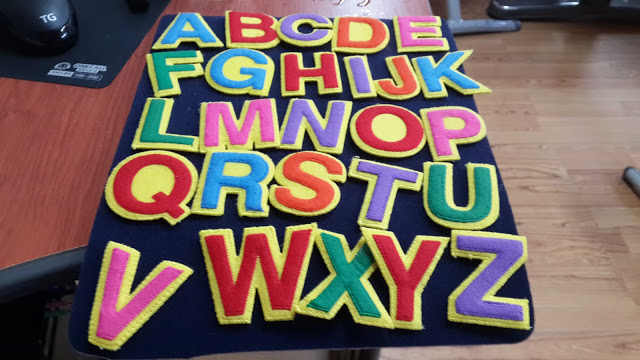 So about 4 students in one big class would have letters "a, e and t" for example. Make sure the entire alphabet is out there. After giving letters to the students I tell them that they must look at their letters carefully and next, I give them a word on the board to spell. This word is a word from the vocabulary list for the new lesson. I wrote can on the board, and asked them to repeat it. Then they had to spell it in claps. The student who has the letter 'C' given to them must clap and say "C" at the same time. The student with the letter 'A' would do the same and lastly, the student with 'N' would do the same also. Therefore, spelling the word 'can'. When you play some students won't have a turn to clap as words will be short. Or some students will have the majority of the letters that appear in the given word. Therefore, they will be clapping and speaking more often than others. This is ok. It's fun that the word is being spelt all around the room and the students get quite eager to see if they can say it fast and be awake. It worked really well with my grade 5 today, they were in a race to see who could be the most on time with their letter when spelling and those who were slow to help the spelling at first, got much better. After, spelling the word I would get them to do our usual routine of writing the word can in English and Korean in their notebook. After each new word given, we spelt it with the clapping and saying exercise then wrote it in our books. Longer words were challenging and later, I played it with grade 5 and found it really good to check who was behind with the alphabet letter pronunciation. It also forced them to all practice spelling because they had to concentrate on which letter was coming next in the word. Obviously for grade 5 and 6 we had much longer words and as an added challenge we did some sentences as well. Worked excellently. You could also play in teams I thought, with 2 sets of alphabet. And the teams take turns and you have words ready on cards to choose from and for grade 5 and 6 - don't show the word, say it. Then that team should spell it, if they make a mistake - no point and let the other team see if they can do it. Good for a bigger class. Another variation of the game is if you get the students to each give you a sentence on a piece of paper. Tell them to keep this sentence a secret, and hand them each one small paper / post-it to write it on. Collect these and put them in a box/jar/bag etc, to mix them up. Next, have one student sit where they cannot see the board (my student sat behind it, as it's on wheels) in a big class they could just be sure not to face the board. Give them a mini white board, or something to write on. Then, you write one of the sentences you pick from the bag and write it on the board. The student who is playing cannot see this, make sure they don't look at the board. When you write it, also be sure not to let the other students say the sentence aloud. Next, have the class spell it with claps like the other game version and the student player is aloud to write what they hear and try to guess the sentence. You could do single words for lower level classes. Yes, I love this. Will use this soon.